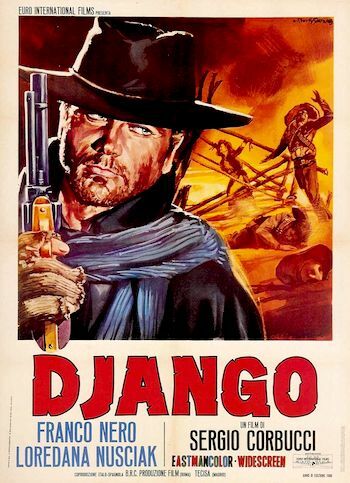 Django is widely regarded as the other movie that kickstarted the entire Spaghetti Western genre. Coming out about two years after Clint Eastwood’s and Sergio Leone’s A Fistful Of Dollars, Django somehow was the one that actually caught on in a huge way in the foreign market (though it remained virtually unseen in America for years) and caused not only every Italian guy with access to a camera to make a new-style western, but also caused them to put Django’s name in every one of their titles whether it was actually about a guy named Django or not. The real Django though has all the memories he needs and we know by his solitary wandering, his stark black outfit and the coffin he drags behind him that he is a haunted man. The film isn’t terribly explicit about what it is that haunts him, but it is clear that some super villain named Major Jackson wasted the love of his life, presumably while he was out fighting in the civil war. He pointedly tells someone that he couldn’t help his love because he was too far away. In that comment he tells us everything we need to know about what happened, the guilt he carries and the pain that is fueling his revenge. Of course there’s also a bunch of gold he’s aiming to steal! Django happens upon a group of Mexicans whipping a woman because she tried to run away from them. Django’s been off in the wilds by himself for awhile, so I think that it’s understandable that he’d just like to stand around and watch for awhile before deciding whether to get involved or not. Suddenly shots ring out and all the Mexicans are dead! Across the way are a bunch of gringos, all with stylish red sashes and/or red hoods. Having killed the Mexicans, they plan to burn the woman at the stake. They’re pissed at her because she deserted them for the Mexicans in the first place. Django is apparently more into seeing women get whipped than he is watching them get burned alive, so he approaches the guys and they hardly have time to lip off to him before he’s shot them all! The woman he rescues is named Maria and he takes her into the deserted town with him. Back at the saloon/whorehouse, only Nathaniel the saloon owner and his passel of hookers remain, everyone either killed or scared off by the war between the Mexican rebels and Major Jackson’s private army. Major Jackson ambles over to the saloon to see what’s going on with this Django character. He brings several of his buddies with him and gets in Django’s face talking smack about how great it was that he brought his own coffin. Django responds by killing just about everyone except Jackson. He asks Jackson how many men he has left and Jackson tells him he’s still got 48 guys in his employ. Django tells him to bring them all next time so that he’ll have an advantage! Django and Jackson’s men have a showdown that sees Django getting down behind a big log that is laying across the middle of the muddy street. He’s eyeing the horizon, waiting for Jackson and his army and I’m thinking that maybe this Django guy has bitten off more than he can chew, but deep down I knew he had some kind of ingenious, crazy scheme that would get him through this battle. But what was it? And what pray tell was in that coffin he’s been lugging around with him the entire movie? 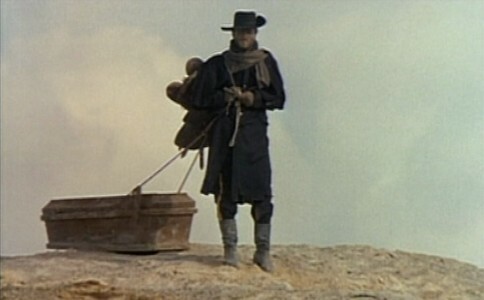 Jackson and his men arrive and Django goes into his coffin and busts out a machine gun! For the next two or three minutes he sprays Jackson’s army with it, leaving a town full of dead guys in red sashes. Jackson gets away and Django later explains (very briefly of course) that he let Jackson get away because he might be useful down the road. The Mexican rebels come back to discover that Django has single-handedly wiped out almost all of Jackson’s army. Their leader, General Hugo Rodriguez and Django go way back to when Django saved his life in prison. The Mexicans want to go back to Mexico, but they can’t because they just don’t have the firepower to get past the Mexican army. Django has a plan that involves making an incursion across the border to some fort and stealing all of Major Jackson’s gold that he’s got the Mexican army holding down there. Doublecrosses and a showdown in a cemetery brings things to an impressive conclusion. Django must have seemed like a revelation to those raised on John Wayne horse operas. 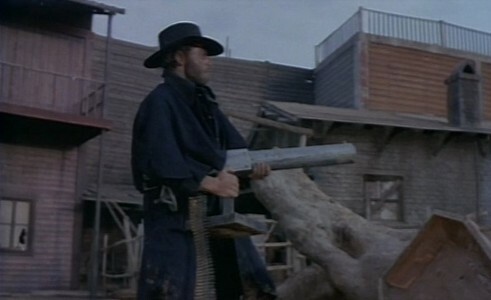 Director Sergio Corbucci’s west is one where no one is to be trusted, everyone is a potential enemy, and the only thing you can hold onto is your guns and the awful memories that force you to keep moving. 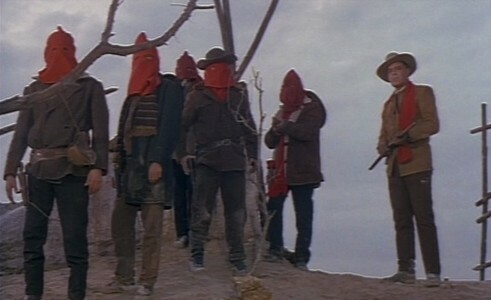 Visually, Corbucci amps up the western with fast-cutting gun battles, brutal fights, and some pretty graphic gore. Franco Nero certainly looks the part here, with his piercing eyes, black hat, and an outfit (his Union army uniform) that symbolizes his inability to shed the past. When he did deign to speak though, the dubbing left much to be desired. The guy who dubbed Django sounded so stiff and stilted that you wondered if Django wasn’t a robot or something. It mars an otherwise enjoyable, though over-praised film.